Dr. Robert Brown has been in practice for more than 15 years. In 2011, he opened Elite Chiropractic & Rehab, offering comprehensive natural health care to all ages in our community. You’ll find our chiropractic care center conveniently located on the east side of Bloomington in the Arches II building at Denbesten Real Estate. As our name suggests, we proudly provide the highest standard of health care. Dr. Brown offers extremely thorough treatments to address all of your concerns, giving you all the time necessary. Appointments are never overbooked, and on your first visit, we’ll perform a comprehensive evaluation to identify your needs. You will feel the tremendous effort we put into your care, with personalized recommendations that suit your desired outcomes. We welcome families and individuals who want to get healthier or feel better to experience the Elite Difference. Chiropractic care isn’t simply about relieving discomfort; its numerous benefits can allow you to live an enhanced lifestyle with an optimally functioning nervous system. When this vital system is operating at its highest potential, you can see your entire life improve! 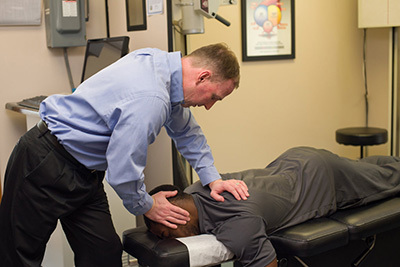 Find out why Dr. Brown was voted Best Chiropractor in Bloomington in 2015. Schedule your appointment today! We offer timely appointments and are a preferred provider for Blue Cross Blue Shield PPO plans.